Heya @DavidOrtinau @EZHart - Thanks for the focus on performance. I just opened a bug where one line of code (Google.MobileAds.MobileAds.Configure) on a default new solution causes a second delay in Entry control focus. I hope this can get prioritization as I cannot release a Google.MobileAds edition until it is fixed or I have a work-around. I am happy to provide more information as needed. @TonyD how are you getting your metrics btw ? I was testing Xamarin.Forms performance on Android today and wanted to see where my app spent its time during startup. After inserting a few lines of code into a demo app I created to get some real numbers I noticed that the app spends a lot of time on startup creating the first view. In my example I have a simple view with a ListView containing five text items, a few Labels and a custom made activity indicator. Loading the view took ~1 second. Removing these user interface elements (a few layouts created by my MVVM Framework were still in place) reduced the time to create the view down to ~0.5 seconds. The total loading time of the app was around ~2.0 seconds on average. (this was all measured in Release mode). I tried to see if the new fast renderers in the latest prerelease of Xamarin would help, but could not see any significant changes (as I expected since I'm not using a lot of controls in the startup screen). After looking at the output from the app I saw that the term AOT was part of a lot of the lines in my output window and this led me to think about the AOT and LLVM Compiler options found in the build section in Xamarin Studio. The compilation took a while (as expected) after turning these options on, but the startup time for the app decreased. The app now loaded in ~0.4 seconds with all the user interface elements in place. From the documentation I see that the AOT feature is still marked as experimental, but I would belive that focusing on moving this feature into a production-ready state would be a great solution for the Android startup issues people are having with Xamarin.Forms. I would be grateful if the AOT/LLVM feature could be part of this performance discussion, and would be interested in other experiences with this feature. @ChristianFalch Ahead-of-time (AOT) compilation will definitely reduce the startup time of your application, because your application won't be spending as much time on just-in-time (JIT) compilation. However, there are trade-offs; if you look at the size of the generated application, I'm guessing it's much larger with AOT enabled. That said, we'd be very interested to hear more feedback on everyone's experiences with AOT enabled. @EZHart I noticed the increase in size, my app grew from ~19 to ~29 megs - caused by the inclusion of the JIT'ed code. This is in my opinion a lot less scary than having a startup time around 3-4 seconds. In addition it should be possible to reduce the code size a little bit by using a tool like ProGuard. I'd really like to test out the AOT feature on some of my production apps, but I'm a little bit scared to make my customers my test bed for experimental stuff. Any background on why this is still experimental? @ChristianFalch AOT LLVM for us on production works really well! That said, it only does after you spend a week making sure the settings are correct and nothing is getting taken out that you use in reflection or the like. Also you will need to download proguard directly and use that as the one included with the android SDK is too old. The last release of Xamarin.Android breaks AOT with or without LLVM. So you cannot AOT anymore. You will need to switch back to VS 2015 and the last stable Xamarin.Android release(not the current stable) if you want to test it. What the heck does your app do, to be that big? That's a massive amount of code. Or does it have a huge amount of hi-res images in the resources? @ClintStLaurent I think you need to deploy the Release version without shared runtime and fast deployment to get the real size of your app when deployed to a device. When trying to use AOT/LLVM on a debug build I don't see any difference in the output nor in the startup speed for the app. @DH_HA1 I see that the size grows on the device after deployment, but I'm not really scared of numbers like 150 megs on the device - the important part for me is the size to download (.apk) and the startup time. @DH_HA1 You're tagging the wrong user in your last comment ;-) I'm talking about building with AOT/LLVM in Release mode - that seems to be the only viable way to get AOT going. @BradChase.2654 - when you say that the last release of Xamarin Android breaks AOT, what are you referring to? Only copy the assemblies you want to help in speeding up startup times. @BradChase.2654 - I just verified that the same problem can occur on VS 2015 with the latest stable. It seems that moving your project to a folder without any spaces in the path will avoid the issue. I haven't verified it on VS 2017, but I suspect it would work there, too. @EZHart ahh thanks for looking into it. When you say no spaces, you mean the entire directory structure? Because I dont use any. That was the first thing I went looking for . To be clearer I dont use any special characters at all. The only ones I do use are "."s. @BradChase.2654 Sorry, I wasn't clear about that. Yes - the entire directory structure, up to and including the project folders themselves. I fired up a new project in the default VS 2015 location ("\Visual Studio 2015\Projects"), and AOT failed with the invalid characters error. I moved that project to a folder without spaces in the path and it worked just fine. Again, that's with VS 2015 and the latest stable release; I haven't tried it against VS 2017. @DH_HA1 - out of curiosity, what are your linker settings for the results on that chart? @EZHart Link all. I haven't done this test in about 3 months so I need to update it with the latest forms. @ChristianFalch what is the Android Store apk download size difference you see between, with and without AOT? Is that the "store apk download size" you mentioned grew from ~19 to ~29 megs? I am also concerned only startup time and the download size. 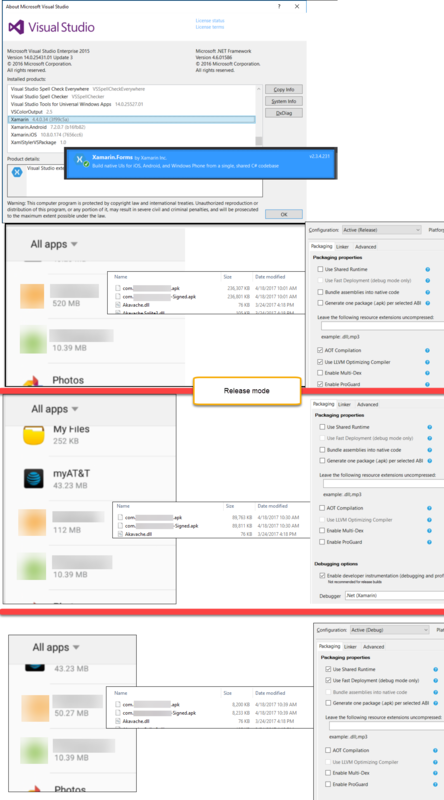 I understand it is very much a normal behavior to have a bigger size in "application manager" for any apps, even the apps which are built with Java. @DH_HA1 Thanks for the numbers and the pointer to the discussion with Jon Pryor. Interesting! @AbdullahNA I'm not done measuring everything yet, but as you say my opinion download size and startup time are the most important factors for our users. @ChristianFalch Thanks! I initially did not pay much attention to AOT, however after reading your post I thought to give it a try. So when compiled my ~29mb all abi apk goes to ~152 megs, and other abi apks go from ~21-24mb to ~46-50mb. 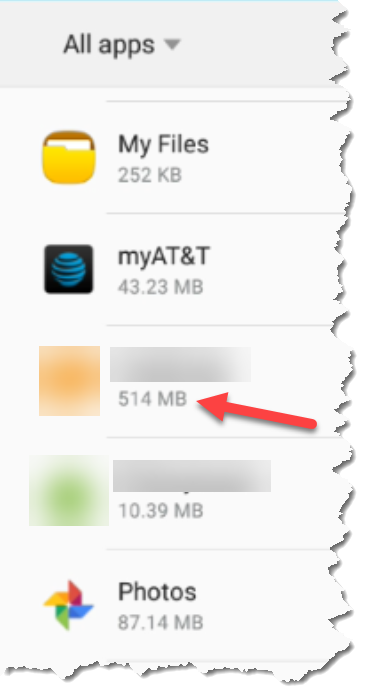 My current apks without AOT with the size of ~21-24mb, shows on store as <10 mb. I am little concerned if I publish the new apks with AOT, it increases the size by more than 10 mb. @AbdullahNA As stated previously, startup time is a more pressing concern than increasing the download size. @EZHart What about looking into a partial AOT to increase startup like @JonathanPryor wrote in the above link, automating the process as part of the build could be of great help. Another question that I haven't found the answer to is: Is the JIT'ed code cached in any way so that it can be reused? If so the startup time should be long the first time the app starts, and subsequent launches should be really speedy. Wouldn't that be a good compromise between startup time and deployment size? Wholly carp.... You weren't kidding. I learned a lesson there. I keep looking for a decimal point and don't see one. Its 10x the size. @ClintStLaurent What's the size of the apk-file? @ClintStLaurent Big enough for sure... What's the size without AOT, both installed and apk, just for comparison? Seemed like a good info-graphic to put together. At some point my boss will want the same numbers and I'd like to better understand these settings. Great work, @ClintStLaurent! As expected the size of the app when using the shared Mono Runtime will be a lot smaller than when building in release mode, but still a huge difference between the two release mode examples. What we could try to do is to create the same infographic for a blank, new app and for one of the samples from Xamarin - this would make it easier for people to compare with their own work. Looking forward to hear more about how JIT'ed code is cached on the device (if it is cached) at runtime - @JonathanPryor or @EZHart? I'm happy to do that off company time. I can run that up tonight from home. Though it will be on VS2017 (latest v 15.1) since that is what I run at home. There are now up to three renderers for some controls. How are component vendors supposed to specify the right renderer? In MR.Gestures I need a custom renderer for each and every control. For AppCompat I created separate controls (MR.Gestures.AppCompatButton) which use other renderers (MR.Gestures.Android.Renderers.AppCompatButtonRenderer which inherits from Xamarin.Forms.Platform.Android.AppCompat.ButtonRenderer). This is pretty awkward but with only the ExportRendererAttribute and without knowing if the end user uses AppCompat or not I cannot do anything better. Will this become even worse with the FastRenderers? Is there a better way how I can configure the correct renderer? (MR.Gestures.Android.Renderers.AppCompatButtonRenderer which inherits from Xamarin.Forms.Platform.Android.AppCompat.ButtonRenderer). I'm not getting on Michael... I'm pointing out how what he needs to do because of the multiple renderers will eventually result in issues for developers. Several packages have issues with long file names for similar reasons and that issue could use some attention. @DavidOrtinau Seems like a good update so far. It says TargetPlatform and Device.OS is deprecated. What's the replacement? However I am finding that the new OnPlatform breaks all my XAML resources in App.xaml, and the C# receives a null when trying to get the KeyValuePair values for each platform. Alright, thanks for this. I think I'll stick with the old one for now. If we use AOT and select multiple architectures, will the sourcefiles be compiled for each selected architecture and included in the apk? If yes, then checking the option "Generate one package per selected ABI" should reduce the filesize, right? @DirkWilhelm Sounds like a good idea to test out. Thanks for the input! @MichaelRumpler - The short answer is "change your AppCompat custom renderer to derive from the fast renderer". If I'm understanding your question correctly, you've already got two custom renderers. One is based on Xamarin.Forms.Platform.Android.ButtonRenderer and the other is based on Xamarin.Forms.Platform.Android.AppCompat.ButtonRenderer. If you don't change anything at all, these will continue to work as they always have. This may require a few other modifications to your custom renderer, but that's the gist of it. With that change, your current ExportRendererAttribute usage should remain the same. Does that make sense? Or have I misunderstood the question? As for the renderer registration akwardness (and I agree, for the AppCompat situation on Android it is awkward), that sounds like a good candidate for a proposal in the Evolution Forum.